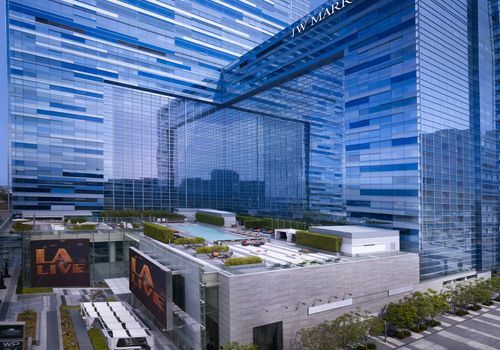 Revel in luxury and a prime downtown location at JW Marriott Los Angeles L.A. Live. Unwind during your California travels in our modern, well-appointed hotel rooms and suites, which offer plush bedding, marble bathrooms, mini-refrigerators, sitting areas, ample desks and Wi-Fi. Reserve an Executive Level room for access to the special perks in our exclusive Executive Lounge. The hotel features a sparkling rooftop pool and bar, a fitness center and numerous superb dining options. Guests also have access to a serene day spa, perfect for rejuvenating. Attendees of Restaurant Directions are invited to book accommodations through the exclusive link provided during registration. Booking within the official room block offers an exclusive room rate and other unique attendee benefits. The JW Marriott will never reach out to attendees to solicit booking rooms. Please make your reservations using only the information below. The group room rate is $269 + tax (based on availability). The group rate expires on Friday, June 28. You will be prompted to make your hotel reservation during the final step of the conference registration process. All reservations must be guaranteed by a valid credit card and a deposit of one night’s room and tax. The deposit will be refunded if cancellations are received at least seven business days prior to arrival. Self parking is $10 hourly or $53.90 per day and valet parking is $53.90 per day.